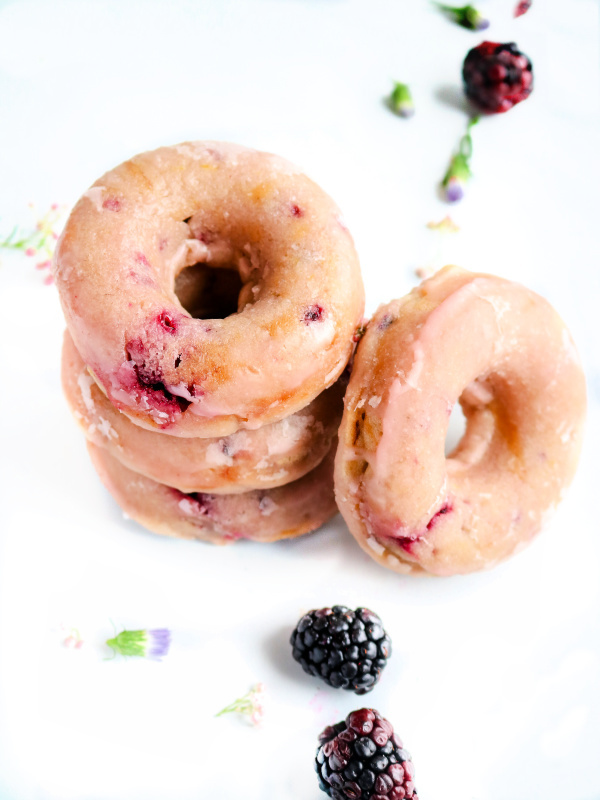 What’s better than an ordinary doughnut?…..a donut filled with fresh blackberries and lemon zest of course! 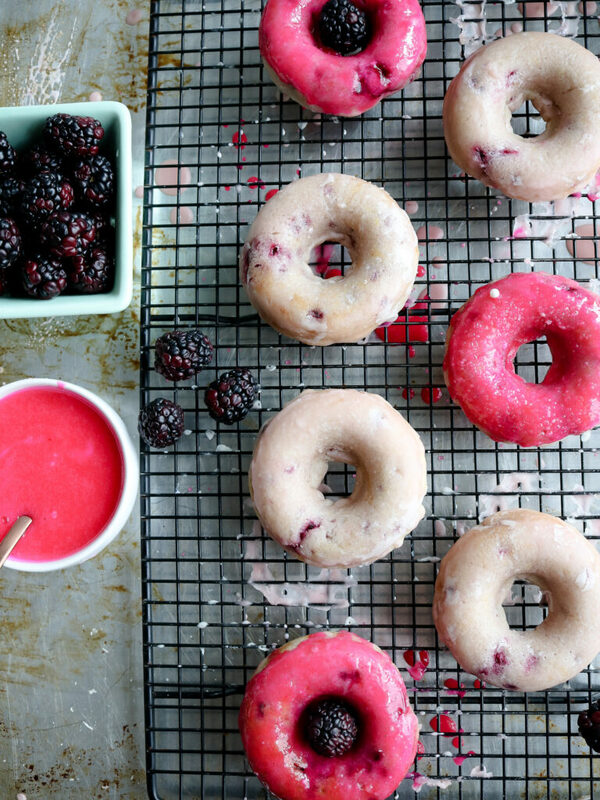 These blackberry doughnuts are easy to make and taste & smell like authentic doughnuts. They are baked, not fried and perfectly fluffy, packed with citrus flavor and bursting with blackberries and covered in a tart glaze. I’d say they are pretty hard to resist! 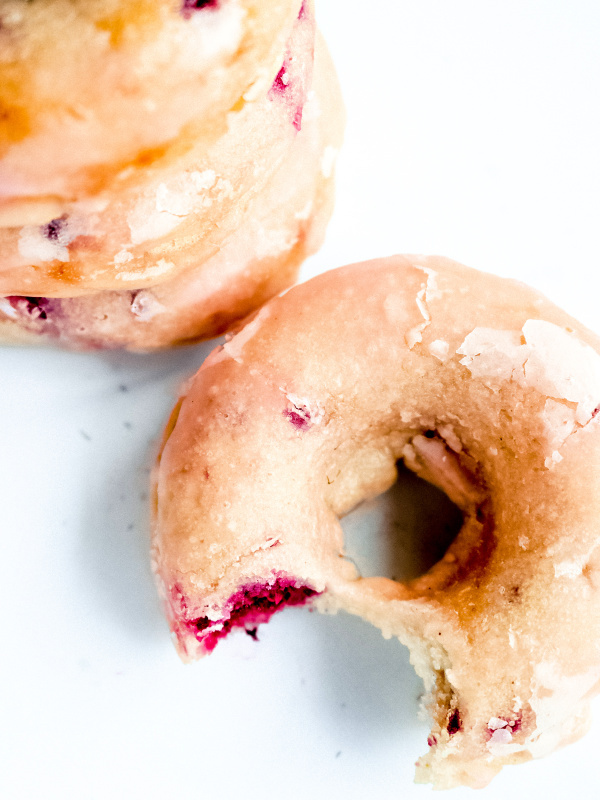 I was originally craving Blueberry Cake donuts…which were my favorite from the donut shop. BUT, then I remembered that I used up all our blueberries in a fruit salad . Well …. blackberries to the rescue! And oh my goodness! 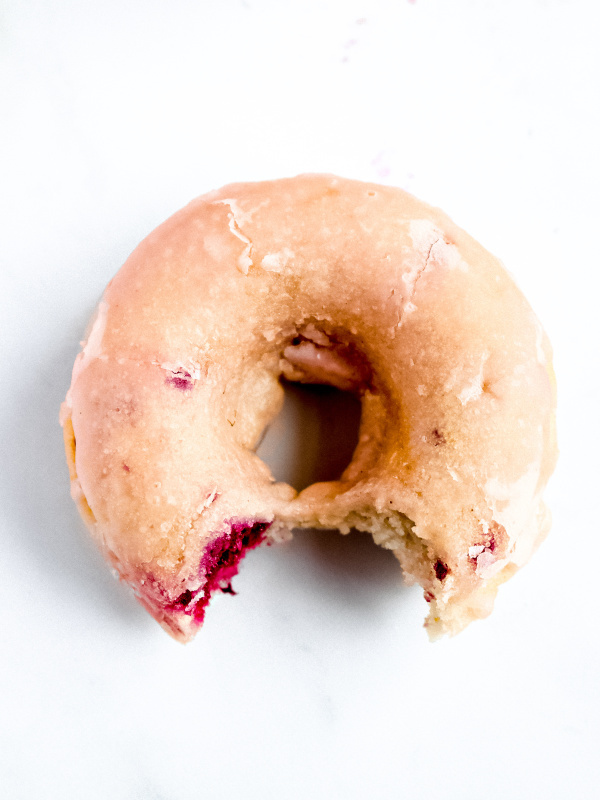 If they had these lemony Blackberry Donuts at a shop nearby, they would sell out in a heart beat. 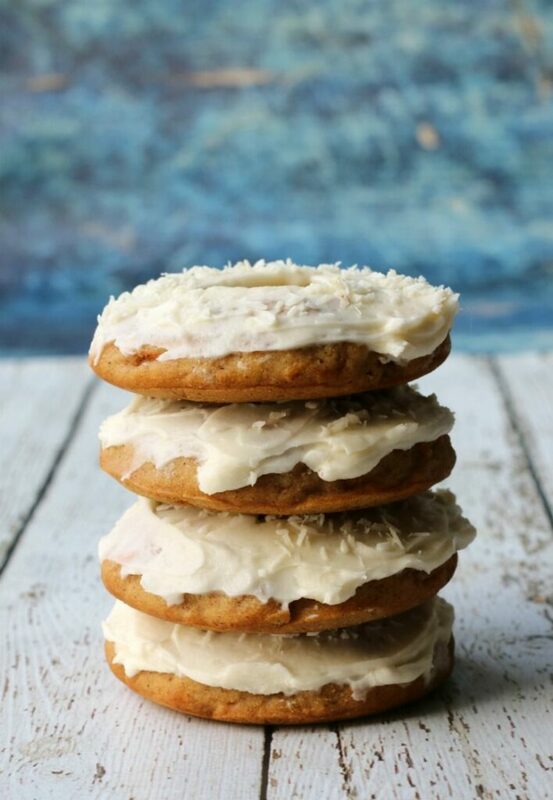 Who cares that they are vegan and gluten-free….no one would even taste the difference! These donuts were amazing. Use the right flour. I used Bob’s Red Mill 1-1 Gluten free blend but it was also tested it using the same amount of Bob’s AP flour. Both had great results but using anything other than these two….I cannot guarantee the results. Use fresh berries if you can. Aquafaba eggs make these donuts light and fluffy. Not sure what aquafaba is….well it’s the slightly gelatinous liquid you find in your can of chickpeas. Use a non-stick donut pan like Wilton’s 6 cavity Baking Pan (affiliate link). I get better results from using this pan, compared to a silicone pan. Use real, granulated sugar… there’s not a lot of sugar in these donuts anyways. 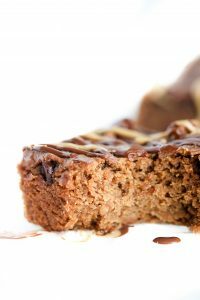 I tested with paleo-friendly sugar like Allulose and Stevia but the results didn’t make me happy. 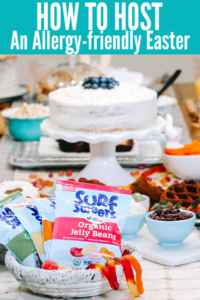 I like Wholesome vegan sugar (its all in how it is processed) and found it to yield the best results. The easiest way to get the batter into the pan is by using a piping bag or ziplock bag with the corner cut off. This is MUCH easier than trying to spoon the batter neatly into each well. I tried several different glaze combinations, but this light and tangy lemony glaze is by far the best choice. Of course you can add a little food color to make the color a brighter shade of pink, but I prefer a more natural look. Which glaze do you prefer? 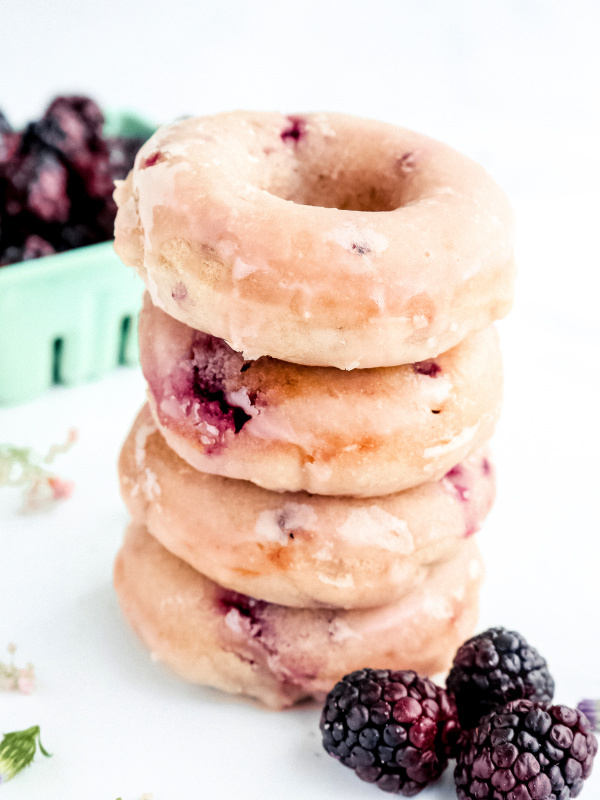 Although these Blackberry Donuts are probably my new favorite on the blog, you can’t forget about our Carrot Cake Donuts, Pumpkin Donuts or Chocolate Donuts. They are all delicious and give you lots of options to choose from. 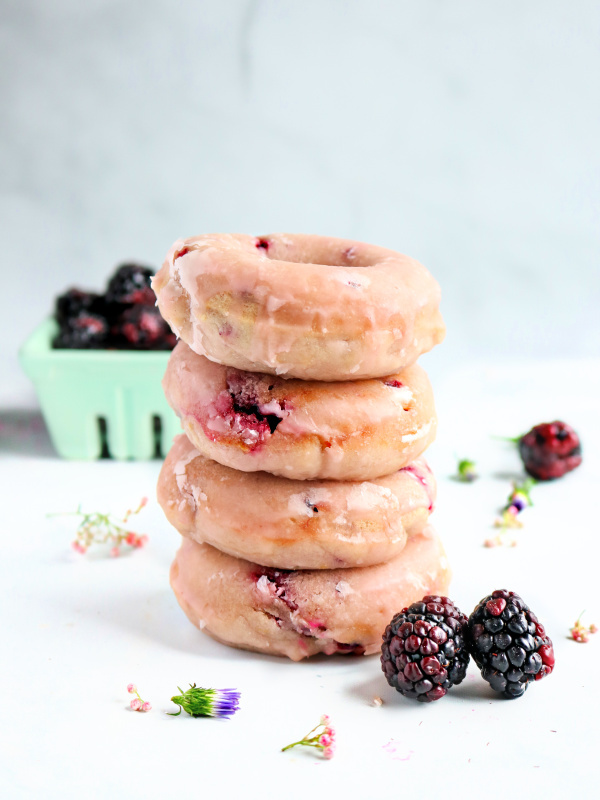 Vegan Baked Blackberry Donuts topped with a simple, yet amazing lemon glaze. 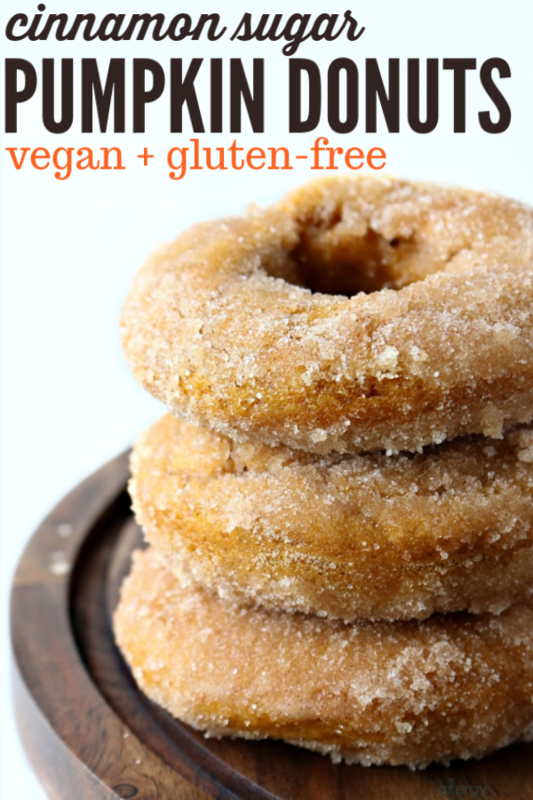 Donuts are incredibly easy to make and perfect for breakfast! Gluten-free & Nut-free too with options. Preheat oven to 375°. Lightly spray a 6-cavity donut pan with nonstick cooking spray. In a small bowl, add milk and vinegar then set aside to curdle. In a large bowl, whisk the cooled butter, and sugar together until combined. Add the aquafaba, lemon zest and lemon extract and whisk until well combined then whisk in “buttermilk”. In a separate bowl, whisk together the flours, baking powder, and salt. Add flour mixture into the wet ingredients, and stir just until combined. Gently fold in the blackberries. Transfer the batter into a disposable piping bag or zip-top bag with a small corner cut off. Pipe the batter into the prepared donut pans filling each cavity 2/3 full. Bake for 8-10 minutes or until donuts spring back when pressed lightly with your fingertip. Cool on a wire rack. Dip the donuts in the lemon glaze. In a medium bowl combine the confectioners’ sugar, butter, lemon zest, and salt. Whisk in enough lemon juice to create a smooth glaze. Any berry of your choice will work. Try this with blueberries, strawberries or raspberries. If the glaze begins to stiffen while dipping the donuts, try warming it in the microwave for a few seconds to loosen it back up. So glad to hear that Noelle! 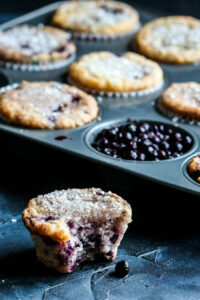 If you love blackberries, then you’ll really love these. I’ve had a difficult time walking away from them. Wow, these look bakery fresh! I have a bunch of frozen blueberries to use up. Do you think frozen would work in these Nicole? I have serious donut cravings being pregnant and I saw these and instantly knew they had to be mine!! I cannot wait to make them this weekend. These look out of this world delicious! Totally a must-make! What other type of “egg” would you suggest? My daughter is allergic to chickpeas. You could really use any type of egg replacer if you cannot do chickpeas. I would suggest something like Ener-G (one of the first egg replacers we used and great for light baked goods). I also have a lot of success with Bob’s Red Mill egg replacer. I’d love to hear which one you try and how it works for you . Huge blackberry fan right here and with a little bit of lemon too??? To die for! Not sure if I’d go natural or pink but hey…maybe I’d do both! Can’t wait to try! I just got a mini donut maker and needed a recipe that was GF eggless! Just printed! Awesome. 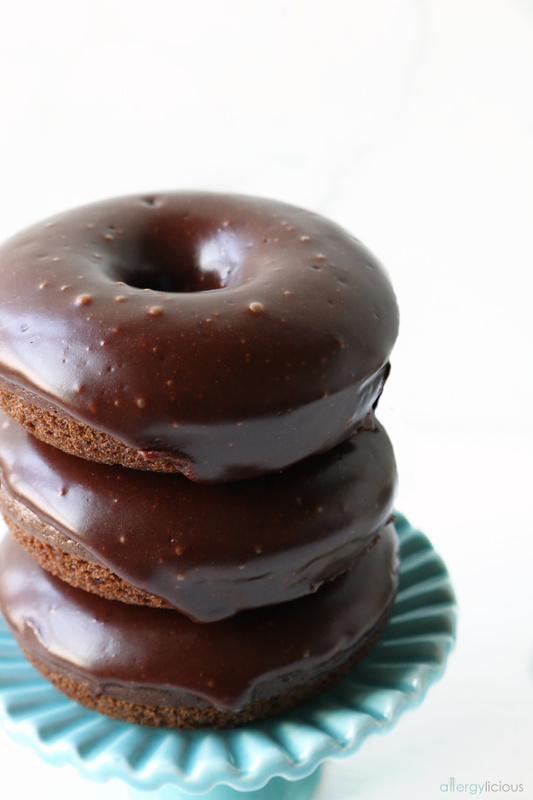 Please let me know what you think….these are my fav donuts thus far. These are just beautiful! I recently reintroduced blackberries since going LowFODMAP and man do I miss them! These look SO good! Thanks Erica. I would be missing those blackberries too. Are you handling them back alright, being back in your diet? Could you use a regular egg in place of the chickpea liquid? We aren’t egg allergic here and I’d love to try these!! Do you do anything to the auqafaba before adding it to the other ingredients, such as whipping it, or do you just pour it straight in? I’ve never really worked with auquafaba successfully before..
For this recipe, you just add it by the measuring spoon. Super easy! What can you use in place of aquafaba? I have never heard of it. You can use an egg if you don’t have an egg allergy or try with another egg replacer, such as Neat Egg or Bob’s Red Mill Egg Replacer? Aquafaba is simply the liquid inside of the can of garbanzo beans. I simply dump my liquid out through a strainer, into a mason jar and keep in the refrigerator until I’m ready to use it. I made these a few weeks ago and they were delicious! The batter was think though, I almost had to shape the donut in the donut pan. Today I made them again and the batter was very liquidy and the after 12min in the oven they still dont look set. I have to be missing something, but I thoroughly went through the recipe and I can’t figure it out. What is the consistency you get with this recipe? Did you change anything between the two times you made these? Change the flour? Use AP or GF flour? Egg replacer? My consistency is like a semi thick batter….like a pancake batter. Can you DM me on IG and I can help you in real time? I cannot use vegan butter or any oils. Have any idea what else would work?? Can you tell me what it is in those that you cannot use, just in case there is an brand or alternative option I can recommend? There are butters made from nuts, that may be an option.